Thank you so much for all you did to make our time after Alan’s passing bearable. 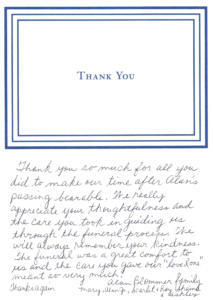 We really appreciate your thoughtfulness and the care you took in guiding us through the funeral process. We will always remember your kindness. The funeral was a great comfort to us and the care you gave our “loved one” meant so very much.